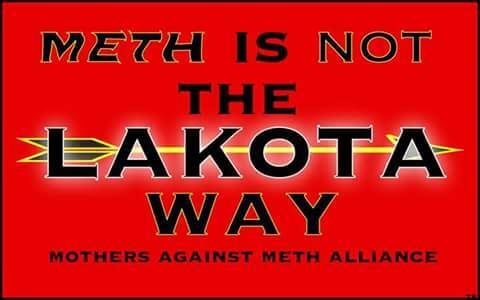 ﻿The mission of the Mothers Against Meth Alliance (M.A.M.A) is to provide competent and compassionate advocacy, community action, media outreach, drug education, and provide rehabilitation resources that reflect the traditions and customs of the Lakota Nakota, and Dakota people for all those affected by Methamphetamine addiction, their families, and their communities. Reservation Methamphetamine Addiction is having a violent criminal impact in almost all our Oglala Sioux Tribal Families, Community and Districts. M.A.M.A came out of a need, at the family and community level, to confront and address these many devastating impacts that this Meth use and distribution is having on tribal membership and the children of our tribes. On July 20th, 13-year-old Teca Clifford. She was gunned down in front of three of her friends on the main street of Pine Ridge Village on the Pine Ridge Reservation, four weeks after her 13th birthday. A suspect was reportedly high on meth at the time of the shooting. On July 28, 2016, two-year-old Kylen Shangreaux was brutally killed allegedly by his biological mother, Katrina, over a potty training accident in Evergreen, SD. Kylen's mother is a known Meth addict which contributed to the continued abuse and death of Kylen.